Inspired by modernist architecture and mid-century art movements, our Canadian jewelry artist creates wonderful, affordable works of wearable art with contemporary appeal. Comprised of cast pewter segments, the Emanation Bracelet features brass highlights and double strand of stretchable elastic. The look is an alluring artistic statement - part industrial and part organic, emanating with modernist appeal. 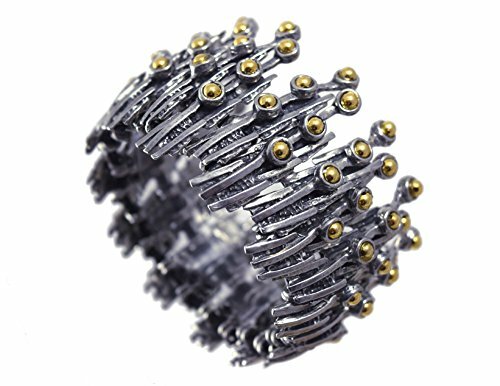 Bracelet measures 7.25 interior circumference, stretchable to larger sizes. Artist designed and made by hand in Quebec, Canada. - What is pewter? Pewter is a white metal alloy consisting of tin with small amounts of antimony and copper. Frequently used for kitchenware and jewelry, pewter is completely lead-free, doesn't tarnish, and requires very little care.